Battle of the Sexes ~ October 8, 2017 ~ I went to see this film and thoroughly enjoyed it! Battle of the Sexes turns out to be a perfectly selected title for this movie. The sub-title could be ~ How Billie Jean King Changed Gender Equality in Sports or The Empowerment of Women in Sports. What impressed me the most about how she did this was the way she handled herself. She didn’t yell, she didn’t scream, she didn’t burn anything, she just stuck to her beliefs. And she never varied from them even when it meant she might have to walk away from the match. Through each of their personal journey’s that unfolded, I learned a lot about both Billie Jean and Bobby. Most I wasn’t aware of. Each was going through very different struggles in their personal lives. 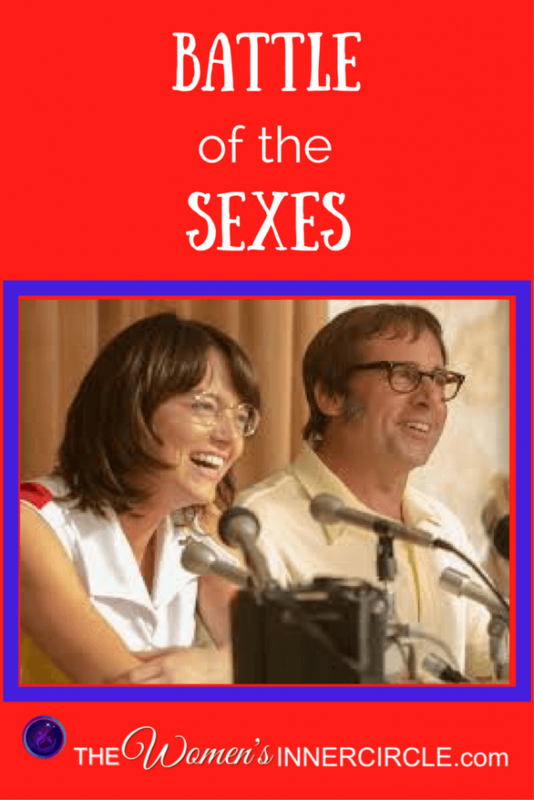 “The electrifying 1973 tennis match between World number one Billie Jean King (Emma Stone) and ex-champ and serial hustler Bobby Riggs (Steve Carell) was billed as THE BATTLE OF THE SEXES and became one of the most watched televised sports events of all time. The match caught the *zeitgeist and sparked a global conversation on gender equality, spurring on the feminist movement. Trapped in the media glare, King and Riggs were on opposite sides of a binary argument, but off-court each was fighting more personal and complex battles. With a supportive husband urging her to fight the Establishment for equal pay, the fiercely private King was also struggling to come to terms with her own sexuality, while Riggs gambled his legacy and reputation in a bid to relive the glories of his past. I thought both Emma Stone (Billie Jean) and Steve Carell (Bobby Riggs) were fabulous and perfectly chosen for these roles. In addition the rest of the cast was wonderful! It was one of the few movies that I was engrossed in from beginning to the end. Never, ever give up on your beliefs. Stay your ground! I highly recommend that you see this movie ~ very enjoyable and thought provoking. Another key takeaway ~ Women can do anything they put their minds to! *zeitgeist is the dominant set of ideals and beliefs that motivate the actions of the members of a society in a particular period in time. I find I am left with a few Questions after the movie ~ was her husband that stunningly handsome in reality, and how many men bet on Bobby Riggs and lost a small fortune?